Schwartz subtitles his book “Breakthrough Scientific Evidence of Life After Death.” Yet, the book is a hodgepodge of variously designed studies and anecdotes. What he seems to demand of the reader is that we take the sum total of all his work (and the work of others) as the scientific evidence for the existence of life after death. He knows anecdotes aren’t scientific evidence. And he knows that inadequately designed or inadequately controlled experiments aren’t good scientific evidence. Thus, even though he doesn’t have a single study in his book that provides such clear scientific evidence for the afterlife that only the most hardened skeptic could doubt it, Schwartz still maintains that overall the evidence is overwhelmingly in favor of his hypothesis. So, what’s the evidence? One of the first experiments he mentions is similar to the one Houdini set up. After Houdini died, he would try to contact his wife using a secret code. Schwartz reports on how he and Linda Russek got an article published in Journal of Scientific Exploration in 1997 that described how they helped psychic Susy Smith develop some codes she would send from beyond the grave when she got there—if there is a beyond the grave—that weren’t simplistic and would eliminate telepathy as an explanation should someone get the code right. The three even got a book out of the project: The Afterlife Codes: Searching for Evidence of the Survival of the Soul (Hampton Roads 2000). As far as I know, there has been no contact yet from Susy Smith. Perhaps she is busy adjusting to her new lifestyle. The pictures were put in an envelope.1 Only Smith knew which picture went with which spirit. Laurie Campbell then tried to contact the same dead folks and get information about the pictures Smith had drawn. Notes were taken and recorded. Schwartz, Russek, and Don Watson were present during Laurie’s reveries. Writes Schwartz: “If Laurie correctly identified the control pictures, this might imply that she was receiving the information through ‘remote viewing’ of Susy’s apartment, reading Susy’s mind long distance, or some other extraordinary paranormal process (sometimes called super psi)” (39). But apparently Laurie’s test wasn’t the focus of this rather informal experiment. When Suzy-with-the-pictures first met with Laurie-and-the-others-with-their-notes-from-her-readings did the experimenters give Laurie an envelope with the pictures to unseal and match up with her remote impressions? No, the first thing they did was bring the whole group together and “in the presence of two video cameras” Susy “opened the sealed envelope” and showed them the pictures she’d drawn. Schwartz makes it clear that it was at the unsealing that the two mediums “met in person for the very first time.” (Schwartz is very careful to give the impression that no cheating went on. However, he does not tell us anything more about Smith’s presence at the unveiling. We have no way of knowing whether it was possible for her to have given subtle cues to the others regarding the accuracy of their guesses, though her presence is enough to invalidate this experiment!) Apparently, the purpose of the experiment involved first seeing if Don, Gary, Linda, and Laurie could guess which pictures were channeled by which dead persons based on Laurie’s reveries. The results: Laurie got one out five right; Don got two right; Gary got one right; and Linda didn’t get any right. The average was 20% right, exactly what would be predicted by chance. Thus it seems that Laurie was not using telepathy nor was she getting messages from the dead. But Schwartz didn’t give up. They did “a second evaluation,2 in which we matched pictures with people based on the information provided from [Laurie’s] readings” and now, he says, “the results were startlingly different” (40). Laurie, Linda, Don, and Gary each got all five right! “The combined probability of getting five out of five in four tries is less than one in a thousand,” writes Schwartz (40). However, there is no experimental design here and we have no idea what kind of communication Susy is providing during all this. It seems that they are told by Susy something to allow them to know how many they got right. Did she tell them which ones they got right? We’re not told. Did she tell them which ones they got wrong? Did she tell them only that they got one or none right? It should have been a simple matter to have deduced which pictures went with which spirit if they knew which ones they’d gotten wrong and which ones they’d gotten right. In his review, Hyman failed to mention the important historical fact that our mediumship research actually began with double blind experimental designs. For example, the published experiment referred to in The Afterlife Experiments book as "From here to there and back again" with Susy Smith and Laurie Campbell was completed almost a year before we conducted the more naturalistic multi-medium / multi-sitter experiments involving John Edward, Suzane Northrop, George Anderson, Anne Gehman, and Laurie Campbell. The early Smith-Campbell double-blind studies did not suffer from possible subtle visual or auditory sensory leakage or rater bias - and strong positive findings were obtained. What was double blind about the study? That neither medium had met the other before the experiment? And that the group who would try to guess which drawing came from which spirit were blind to which spirit did which drawing? There should have been one experimenter who knew which drawing went with which ghost and which was the control. The other experimenter and participants should have been blind to this data (which they were). Susy should not have been present when the group first viewed the drawings, as Schwartz himself admits: “the design would have been experimentally cleaner if the drawings had been examined in the absence of medium one” (Noetic Journal 1999). Each of the evaluators should have worked in private at guessing which picture went with which ghost. They should have done this with Laurie’s notes and their own notes, but not in the presence of Susy or the others. Schwartz dismisses having Susy present at the guessing session as an oversight but irrelevant because what he calls “the primary data of interest” was collected before this session. That is, Laurie Campbell (LC) had done her readings and she and the group had taken notes before meeting with Susy. These notes are considered “the primary data.” Schwartz wants us to believe that Susy’s presence while they identified the drawings made no difference and that they used only a table of colors and forms (constructed from LC’s notes) to make their decisions when they each got each drawing right. He seems to think the only problem with the experiment is that telepathy or clairvoyance might account for how they got Susy’s drawings matched up with Laurie’s notes (based on her attempts to contact the dead co-conspirators). So, he can’t be sure the dead were really involved. The mediums for the HBO experiment were George Anderson, John Edward, Anne Gehman, Suzane Northrop, and Laurie Campbell. Each of these mediums, except George Anderson, also worked the Miraval experiment. Two sitters were used in the HBO experiment, a 46-year-old woman (sitter one, Pat Price) and a 54-year-old woman (sitter two). Both were selected because they had experienced the death of at least six loved ones in the past ten years (294). According to Schwartz, the mediums did not know anything about the sitters except that they “had experienced the loss of multiple loved ones in a ten-year-period” (294). Pat Price participated in the Miraval experiment, but the other HBO sitter did not. In fact, even though the original design of the Miraval experiment was to involve ten sitters, only the results with Pat Price are reported in the published JSPR article. The protocol for the HBO experiment was as follows: Mediums and sitter one were fitted with an electrode cap. EEG and ECG signals were recorded. Nothing of much interest seems to have been discovered by using electrocardiograms and electroencephalograms, unless you consider it interesting that “the medium’s heart tended to beat when the sitter’s heart was not beating” (302). Schwartz et al. think it is interesting because they think it eliminates the telepathy hypothesis (307). Schwartz et al. write that the purpose of using these devices was “to illustrate the potential of using such techniques in future research to address possible biophysical mechanisms of anomalous information retrieval” (303). The sitter and medium sat in comfortable chairs, separated by a screen. Both faced the recording equipment of the HBO folks, including two video cameras. The readings were all done in one day and took about an hour each. The order of mediums was chosen by the mediums. The ones not reading hung out in a courtyard where they were monitored to make sure they didn’t talk about the readings. The mediums were free to do the readings whatever way they wanted, as long as they restricted themselves to yes or no questions. The readings “lasted for approximately 15 to 20 minutes.” We can take it that there was no agreed upon beginning and end of each session established before the session began. They don’t say who decided when to end each session. The mediums were instructed not to discuss the readings until the experiment was completed, but they don’t define when that might be. The sitters did two ratings of the sessions: one was done immediately after the sitting (the secondary data); the other was done several months later (the primary data). For some unexplained reason, sitter two’s readings are ignored in the published paper. The ratings done immediately after the readings focused on how many of the six spirits—named by the sitter as those she hoped to contact—did the sitter think the medium contacted. The ratings done several months later were done by having the sitters evaluate transcripts that had been analyzed and itemized accord to six categories: name, initial, historical fact, personal description, temperament, and opinion. The rating scale went from -3 = definitely an error to +3 = definitely correct. Apparently, the categories were generated after the readings and were not based on any preconceived notions about what kind of data spirits should be conveying or be able to convey. Results from the secondary data (the rating done immediately after the reading): Sitter one thought that the various mediums had identified many departed persons she had listed before the session (based on an original list of 6). The results were 5, 4, 3, 3, and 4. We’re not told how they were identified, but apparently some were identified not by name but by relationship to the sitter (son, mother, grandfather, dog of son, and the like). We’re told the “average percent identification was 63%” (296), i.e., 19 identified out of 30 possible (5 mediums times 6 ghosts).3 We’re also told that this data was not primary, but it might have been interesting to find some controls about the same age, same gender, and with at least 6 dead relatives during the last ten years and had them hear tapes of the readings and use the same evaluation sheets used by the sitters to see if the controls could match the data to their lists of six dead loved ones. Using proper controls is something Schwartz fails to do in almost every experiment he cites in this book. Schwartz et al. give no reason why they considered the immediate ratings as secondary. Nor do they explain why they didn’t devise some sort of control procedure for this part of the test. The results for the second evaluation, the one done “a few months after the data was collected” were considered to be the primary data (294). Most items were rated by the sitters as -3s or +3s. Only the +3s (definitely correct) were counted and apparently they were measured against the total number of items generated. That result, 83% accuracy (299), was compared to how many right answers the controls got, 36% (299). The controls were 68 college students, mostly young women; Schwartz notes that they should have been middle-aged women, like the sitters. An equally significant problem is that the controls didn’t have the same task as the sitters, so he end up comparing apples to oranges. His 83% versus 36% is a meaningless and misleading comparison. The college students were given a list of 59 items (e.g., "Who called the sitter 'Patsy'?" "Was the sitter’s child happy?") to evaluate. The items were statements made by during the readings that were turned into questions. This was not a comparable task to that of the sitter. To compare the answers given by the “controls” to Pat Price’s ratings is irrelevant. Schwartz et al. used this method for the controls, they say, because “it was impossible to estimate ahead of time base rates per item” brought up by the mediums during the sessions. That may be true but it doesn’t justify using an irrelevant control group given a different task from the experimental group. Also, Schwartz owes us some explanation as to why the other sitter's data are not included in the published paper on the HBO experiment. Schwartz et al. claim that they have evidence from the yes/no question sessions that show that “it is impossible to claim that medium 1’s percent accuracy ratings [80%] were due to ‘cold reading’ and ‘fishing for information’ because he only asked five questions (298). This is very good example of why we can’t trust Schwartz when he claims he has ruled out the cold reading hypothesis. He doesn’t understand the role of subjective validation in cold reading. Some mediums don’t ask any questions of their sitters before giving them their personal readings. Forer didn’t ask any questions of his students before giving them their personal personality charts, yet they rated the charts as 85% accurate. Randi didn’t ask any questions when he passed out fake astrological readings to a classroom of students. Yet, in many cases the clients, sitters, etc. validate the data at about the same rate that Schwartz got. Schwartz calls this the Russek Protocol. He though it would eliminate the possibility that the mediums were using the standard cold reading techniques of fake mediums. The Miraval experiments use the Russek Protocol (sitter-silent session) in addition to and immediately preceding a yes/no question procedure. Also, the sitter is present during the silent-sitter session and hears everything the medium says. How could this not affect the sitter’s understanding of and responses to the yes/no question procedure? Thus, the two together should be considered parts of one procedure, not two procedures. Why the two procedures? Because, writes Schwartz, this was a compromise “designed to give the mediums a sense of assurance that they would not completely fail” (129). “This is also good science,” he says, because “you repeat a procedure that has worked in the past (replicate), and you add a new aspect that you want to explore (extend). This is a regular part of ‘doing science,’ and we follow the concept of ‘replicate and extend, replicate and extend’ regularly in our own laboratory, as one of our research mantras” (129-130). However, if the experimenter adds a new aspect to explore in an experiment, he must be careful that the new aspect doesn’t compromise the replication. I would have done the silent procedure as a separate experiment. And I would have done the same without the sitter being able to hear the medium do the reading. Several readings could be collected and sitters (blind to whose readings they were evaluating but evaluating them as if they were their own) could be asked to evaluate several readings. In any case, the plan was to use ten sitters but only one finds her way into the published paper. No reason is given that I can find as to why the data for the other nine sitters were not used in the published paper, yet some of the data is given in the book. For example, we learn that Linda’s mother was one of the sitters (139). Diane Goldner was a sitter (140). Heather Rist was a sitter (141). Christopher was a sitter (chapter 10 “The Christopher Readings”). Pat Price, of course, was a sitter and that makes five, but the other five aren’t mentioned in the book. Some of the data on some of the other sitters beside Pat Price is given in chapters nine and ten. This data must be treated as anecdotal, since it is not detailed and reported in the scientific paper. The impression is that Schwartz culled the best supportive anecdotes from the data and put them in the book, but left them out of the peer-reviewed paper because the overall data wasn’t that good. But we can only guess as to his reasons for ignoring most of his data in the published paper. The data from the Pat Price reading is included because it seems spectacular to Schwartz. But no matter how spectacular the Pat Price reading by John Edward seems, it represents only part of the data collected and no explanation for not presenting all the data is given. Final comments on the HBO & Miraval experiments. Fishing for information is not always used in cold reading, but it can be. What is more important is having sitters who are eager for the mediums to succeed. Schwartz need not fret over designing experiments to assure the mediums will feel they have a chance to succeed. They can’t fail as long as the sitters are willing to see them succeed. They will get the same results even when the reading is done miles away from the sitter as long as they think the reading is personal and meaningful to them. Give them several readings to rate blindly and they will find one they think is theirs and they will validate it at a significantly higher rate than the others. Overall, there are a number of problems with these experiments. Hyman goes over some of the more important ones. I’ll just say that Schwartz has a lot of faith in people and their integrity. He seems satisfied with affidavits that people won’t cheat and with sitter assertions of facts that “could be checked,” but he doesn’t seem to have systematically checked out the facts reported. In the book, he repeats again and again that fraud is not an option, yet despite some of the care he takes to batten down the hatches, he leaves a few portholes open. More significant, however, is his lack of true controls and his misunderstanding of what cold reading consists of. He seems to have very little understanding of the process of subjective validation. Explanation: Cold Reading = The medium simply picks up the sitter's verbal and non-verbal clues and says them back to the sitter. Control: The medium is not in the same room (and usually not in the same building, state, or even country) as the sitter and cannot see or hear the sitter. He considers these experiments, described in Part IV (the Canyon Ranch Experiment), chapters 13 and 14, and the Laurie Campbell "white crow" experiment, to be the best of the lot. Ch. 13. The Canyon Ranch Experiment: What if the sitters never speak? In this chapter, Schwartz notes that as a scientist he must be concerned with designing an experiment that eliminates as far as possible the chance that they are the “unwitting victims of error, intentional or inadvertent” (175). “We had to rule out any possibility of deception, cues from the sitters, errors in the scoring technique, or some other hazard we couldn’t even imagine.” So, they decided to bring in an expert psychic magician, a “cold reader” named Ross Horowitz. “I studied this material carefully," says Schwartz, "Yet, the more I investigated the secret tactics of psychic trickery, the more I became convinced that the mediums I had been observing in our laboratory could not, and were not, using these age-old tricks” (176). Horowitz examined Schwartz's videos and concluded that he couldn’t find any indications the mediums were using psychic cold-reading techniques. (Ross admitted to Schwartz that he does hot readings in his performances (“obtaining secret information beforehand” or “holding a dialogue with the sitter”). Schwartz also made sure that the phones weren’t tapped to make sure there was no hot reading going on. Schwartz tells us that the design of this experiment was to avoid the criticisms of skeptics (179) such as sensory leakage, fraud, cold reading, cueing. He doesn’t say where the sitter was placed. But he notes that the “Russek silent paradigm” would be used—during the first 10 minutes the sitter doesn’t speak. “During this ten-minute period, the mediums were requested to speak out loud whatever information they received about the deceased loved ones of the sitters. The mediums were not allowed to ask any questions of the sitters” (322). Each medium would have the same experimenter throughout. Schwartz says the experimenters “were emotionally detached from the information being received,” which is true in the literal sense, but Schwartz is clearly not emotionally detached from how the sitters respond, as his many comments throughout about dazzle shots, etc. make clear. There would be five research sitters and “they would write down in advance the details of the lives and their relationships with the deceased people they hoped might take part. These records would be sealed, unseen by any of the experimenters until the scoring session, much later” (179). A room would be set aside as a “sitters’ sequestering room” where they’d wait between readings outside of any contact with the mediums. Sitters would be identified by name and had to have a real interest in confirming the research hypothesis. But, he says, “The number one component in selection was integrity” (181). Schwartz notes that to reduce rater bias they “decided to require that each reading would be scored not just by the sitter of that reading but by the other four sitters as well.” Each sitter would have three readings (182). What he doesn’t tell us is whether the ratings would be blind. He doesn’t tell us this in the published paper, either. But this is apparently what happened. “The three experimenters also scored the 15 readings as if the information applied to them” (323). This time the rating scale was -3 for a miss up to +3 for a direct hit—see p. 119 for his description of this scale). That is how the experiment was designed, but in chapter 13 Schwartz doesn’t provide us with the data. Instead he provides us with what he thinks of as "dazzle shots" by John Edward. So the only criticism one can make, not being privy to the data, is to examine what Schwartz considers Edward’s dazzle shots and see if there is a better explanation for what he said than the spirit hypothesis. Despite Schwartz’s rejection of the cold reading hypothesis, I think that’s exactly what is going on. Schwartz doesn’t see it because he has been misdirected. He is looking for deceit and trickery on the part of Edward. What he should be looking for is how the sitter responds. Unfortunately, we can only guess at that because Schwartz doesn’t give us the full transcript of what went on—he only provides a small bit of the data. But here goes anyway. Sabrina Geoffrion, a member of the research and administrative team in Schwartz’s lab, was a key sitter. “I knew her commitment to research and knowledge and knew I could trust her; trust was the key” (180). She’s had “extensive training in experimental science” (181). In his reading with Sabrina, Edward uses several expressions repeatedly…..”I want to acknowledge,” “coming through to me,” “they’re telling me,” “they are acknowledging,” “there’s a feeling of,” “they’re showing me,” “there’s a connection to,” “she’s showing me,” “I don’t know if that means” x or y. Here is a list his impressions. Schwartz comments that the sitter connected #3 to her son’s middle name (taken from her grandmother’s maiden name). He doesn't note, however, that there are very few families that don’t pass on a name. Bringing in initials nearly guarantees most people will be able to find someone in the family with either the same name (first, middle, maiden, etc.) or initials. Schwartz notes that the sitter connects this to her grandmother. One might wonder why her grandmother would introduce herself from the grave to her beloved granddaughter by bringing up the two dogs. Schwartz explains this in chapter 16 where he discusses the question as to why the dead “always give such boring information.” His answer is that first of all the spirit only gets a few minutes with the medium, so it has to get its message across quickly and simply. There’s not enough time for complex messages. Secondly, the spirit knows the living aren’t interested in “the latest scientific discoveries” and the like. The living want to “give and receive expressions of love.” The spirit “first and foremost” wants to prove to the living that the spirit still exists (the spirit’s goal is to confirm the afterlife). Is it just coincidence that the spirit’s goal just happens to be Schwartz’s goal, too? (221) The spirit wants to prove to the living that the spirit “still cares,” that the relationship they had in life continues “forever.” That’s why the spirit relates info the living will know; that’s why the spirit acknowledges “present things” in the sitter’s life that she can verify. Continuing with the experiment. Schwartz comments: “In the yes/no period, even though John heard only my voice and never the sitter’s, the information became more specific, just as we had expected” (184). He doesn’t say why he expected the information to become more specific, but it is obvious that giving feedback to the medium gives him direction. Schwartz doesn’t tell us about the impressions John Edward threw out that Sabrina couldn’t make sense of. All he tells us is that John eventually identified a “large white poodle” as one of the dogs that was bad and would eat everything from ‘shoes to wood chips’. Schwartz apparently made no effort to verify these claims, but took it for granted that since Sabrina is trustworthy, her word should be taken that grandma had a bad white poodle that ate everything in sight. He gives no indication in this chapter that it is important to try to verify the claims that Edward makes and the sitter validates, but in his paper on these experiments, he mentions that Sabrina’s mother verified a few facts. (Actually, in the draft published in his book as Appendix C, he says only that the information from Sabrina “was independently confirmed.” Someone who read the paper must have asked “By whom?” because in the published paper he adds “by the sitter’s mother (who is a professor at the University of Arizona)”. Other than this one reference to fact-checking, he doesn’t appear to have done much of it. Schwartz has already noted the importance of eliminating potential errors, but he seems oblivious to this obvious source of potential error, even after noting that people often try to save the medium embarrassment by affirming claims that aren’t’ true. The sitter might also misremember things or, out of zeal, intentionally lie, no matter how trustworthy she might be in general. Many pious people have been known to lie to promote or defend their pious beliefs. It would be a simple matter for Schwartz to check out factual claims made by mediums that are validated by sitters. Schwartz comments that since her grandmother’s death, Sabrina had gotten married. Now we shift to another wedding altogether…the sitter’s mother’s wedding. Schwartz notes that the grandmother had sewed a ring of daisies into her daughter’s hair at her wedding. Schwartz claims that “The reference to daisies at a wedding is a highly improbable one” (185). Maybe, but that’s the beauty of push statements, statements that are likely to be rejected at first, but "can almost always be made to fit if the psychic pushes with sufficient confidence and, at the same time, subtly expands the scope for agreement" (Ian Rowland, p. 65). Even push statements can be given immediate meaning sometimes. Here we have to shift from one wedding to another, the sitter’s to her mother’s, but some sort of connection is made. Actually, this statement may not be a push statement, but a trivia fact. Many women make daisy chains and they are often made to occupy and amuse children, even at weddings. My wife made one for our granddaughter at a wedding. It wasn't the first or last time for such daisy-chain making, either. One of the more curious things in Schwartz’s experiment is that after the session with Sabrina ended and another sitter was brought in, Edward claimed that he was still “carrying the … other woman’s grandmother” with him. Comment: How did he know the sitter was a woman? Who knows? Maybe he smelled her perfume. Maybe he heard Schwartz inadvertently thank Sabrina by name. Maybe he got feedback from the reading. Maybe he knew that all the sitters would be female. Sabrina the witch looks like a dazzle shot, since the sitter’s name is Sabrina and she later verified that she used to be teased about being called Sabrina the teenage witch and she ran to her grandmother for “comfort and understanding.” Because the sitter’s name was Sabrina, it seems unlikely that this is a coincidence and looks like “an incredibly good hit” (187). Incredible is the operative word here. Was there sensory leakage? Did Schwartz inadvertently thank her by name when he escorted her out and did Edward overhear? Did Edward meet Sabrina when he came to the University? Who knows? Schwartz reports that after the extra-session session, he went to the sitter’s room and asked Sabrina if “On the Good Ship Lollipop” meant anything to her and she started crying. She said that “as a child, her hair had been in short, curly locks. When she sang and danced, her grandmother would tell her that she looked like Shirley Temple” (188). Schwartz doesn’t consider that there are lots of things that would look like dazzle shots if the sitter can find some significance in them. Grandma used to give her lollipops when she was a kid. She or her mother or grandmother drank Shirley Temples instead of alcohol. She had curly hair. She took a ride on a ship with her pop. She called one of her dolls “Lolly.” Even so, one wonders: what did Edward say that we aren’t told about in Schwartz’s account? For an answer to that question, we might turn to Appendix D, his article on the Canyon Ranch experiments that was submitted to the Journal of the Society for Psychical Research in March of 2001. “Accuracy and Replicability of Anomalous Information Retrieval: Replication and Extension.” It appeared in Volume 66.3, Number 868, July 2002. However, the published paper doesn’t give us the whole transcript. Though Schwartz focuses on the one sitter in his book, the published paper gives the results for all five sitters’ readings done by the three mediums. A skeptic might expect that the sitter ratings would reflect subjective validation since the sitters (1) heard the mediums give the readings before the rating sheets were made up and filled out, and (2) were sequestered together. And they did. However, they weren’t. They rated their own at 40% successful; while they rated the others at 25%. They also rated the misses at 29% for their own and 42% for the others. Like Dean Radin, Schwartz likes baseball analogies: Michael Jordon was only successful in shooting baskets 45% of the time, he notes. Our mediums were right 40% of the time. Not as good as the 80% when they had no silent-sitter sessions but had good feedback and rated the hits during the sessions. As to why the 80% success rate with Pat Price and 5 mediums dropped to 40% with five sitters and three mediums: my guess is that it had to do with tighter controls, but that is just a guess. In the Canyon Ranch sessions, the sitters listened to the medium do the reading during the silent session, and were asked to rate their own readings and the others for accuracy. Schwartz thinks that because Edward got grandma, the dogs, daisies, Good Ship Lollipop, and Sabrina the teenage witch (that is, that Sabrina validated the grandma, dogs, daisies and good ship lollipop, and Sabrina was her name), that “it is highly improbable that rater bias can explain the totality of the findings.” True enough, but could it have been due to sensory leakage? Forgetting the issue as to why a spirit like a girl’s grandmother’s spirit would communicate through John Edward rather than directly to the girl and would do so with hints about dogs and daisies, songs and TV programs, there is the issue that Schwartz overlooks, namely, that once the sitter has identified the spirit, she is highly motivated to find a connection to whatever Edward throws out. Schwartz seems to think that the odds are nearly impossible that someone else would be able to make sense out of grandma, poodles, daisies, Good Ship Lollipop, and Sabrina. We must remember that, while the data for the published study focused on the sitter silent session, this data came in during the question period and after, and we don’t have access to the tapes. We don’t know what else John Edward posited that didn’t pan out. In any case, Schwartz is too quick to rule out the subjective validation hypothesis. In fact, he doesn’t seem to be aware of this as a problem or he would have designed the study differently. By letting the sitters hear the medium in the silent session, they are already biased when they go to rate the different readings. Schwartz seems to think that cold reading only involves the medium. It doesn’t. It involves the client as well, and subjective validation is an essential part of any cold reading. Were he aware of this, he would not be as impressed by the 40% versus 25% ratings. Final comments on the Canyon Ranch experiments. Schwartz begins ch. 14 by noting that most mediums tell their clients that they “have no control over who might choose to come through in a given reading.” Doesn’t this possibility of “cross-talk” (his term, p. 200) make the idea of a controlled experiment for spirit visits ludicrous? Schwartz is very impressed with John Edward’s reading for him. He thinks his (Schwartz’s) mother showed up at the reading. Again, he’s impressed by silly things like the fact that John Edward says that Morris is known by two other names that sound like Maurice or Merle. Schwartz gets very excited when he finds out that his uncle Morris was known as Moshia or Moe. Schwartz says he’s an agnostic, a scientist, but he readily admits he’s “inclined to think” like a believer (see pages 194-195). On p. 197, he discusses how he had his sitters rate the data in the Canyon Ranch experiments. He doesn’t seem to understand subjective validation at all. Of course, the raters are going to rate their own reading higher than the controls. That is consistent with the subjective validation hypothesis. He really is oblivious to the fact that knowing or believing which reading is yours will affect how you rate it. As will knowing or believing which reading is not yours. A pre-reading “contemplation period” initiated the experiment, during which the medium “attempted to receive information about the sitter’s deceased loved ones before the readings began.” Schwartz calls this pre-reading “the Campbell Procedure.” The readings were then done over the telephone. There were two readings in each sitting. In the first reading, they used the Russek Procedure, in which the sitter hears the reading but remains silent. This material would later be itemized and rated blindly (?) by the sitter. In the second reading, Campbell (over the phone) read the sitter, “item by item, the content received during the pre-reading contemplation, and asked for the sitter to confirm, question, or deny the information” (339). “Sitters were encouraged to attempt to personally connect with their deceased loved ones and invite them to communicate with LC prior to their scheduled appointment times with LC” (337). And “They understood that some of the transcripts they would recognize, and others they would not.” The sitters were not told ahead of time which of the “blinded transcripts” were their transcripts until after they had done the scoring (338). In their paper, Schwartz and Russek note: “Since the exceptional nature of the data reported here was not anticipated ahead of time, the experiment did not include additional desirable controls such as independent observers of all the procedures to establish that the experimenters were not engaged in conscious or unconscious deception. However, the experimenters are exceptionally sensitive to the possibility of unconscious 'leakage,' if not conscious collusion” (338). As I noted earlier, Schwartz works on faith, rather than proper scientific protocol, much of the time. They write that the Campbell Procedure “definitively eliminates conventional explanations of cold reading, subtle cueing, and medium fraud, as possible explanations of the findings” (338), but it doesn’t eliminate subjective validation. Nor, they note, did it eliminate telepathy as an explanation (339). They only report on the Dalzell readings, presumably because they found them so exceptional. However, it is highly irregular for a serious scientist to do an experiment and omit 2/3 of the data. As we have already seen, Schwartz thinks nothing of omitting even 90% of his data without providing an explanation. In any case, Dalzell said he asked four ghosts (“departed hypothesized co-investigators”) to come to the reading. Part of the success of the reading would be judged by how many of these ghosts were identified by Campbell. They concluded that all four made contact with Campbell: Michael (dear friend), Alice (an aunt), Bob (father), and Jerry (close friend). One problem with this design is that apparently Dalzell confirmed that he’d invited just these four ghosts after the reading. Schwartz writes: “It is unfortunate we did not think to have GD write down the names of the people invited 24 hours before the reading, and have this document notarized.” Unfortunate? I wish he were joking, but he's dead serious. Schwartz is up front about Dalzell’s book that supports the living-soul hypothesis for his dear friend Michael, a book whose manuscript was in Schwartz’s possession during the readings, but which he testifies was kept out of Campbell’s sight. Even so, Dalzell is a very highly motivated sitter. Trusting him regarding factual claims, rather than instituting proper controls and fact-checking everything possible, severely weakens the importance of this paper. Schwartz did do some fact checking. For example, he was very impressed that Campbell got “four additional facts not known by GD and later confirmed by sources close to GD indicating that exceptionally accurate information was obtained for GD’s deceased family and close friends” (342). However, this data was ambiguous and became specific only when related to the deceased. It’s quite shocking that Schwartz was surprised that phase 3, the actual reading, had the most precise information, especially since it consisted of reading back phase 1 to the sitter who then gave feedback. Some of the hits are reminiscent of the Maimonides dream telepathy hits (like the Churchill hit for “Descent from the Cross”), namely, Campbell says Michael saw the world through “lots of glass” and since he was a flight attendant, the windows of airplanes are taken to be the “lots of glass.” Think of all the other kinds of things than might count as a hit for lots of glass! Anyway, airplane windows aren’t made of glass. The bottom line is that “GD estimated that the information was at least 90% accurate” (344). But Schwartz dismisses this as not evidential because it was the kind of information that “is general and widely applicable.” But, much of the info was “highly specific and organized for specific individuals” and was also at least 90% accurate, according to GD. Schwartz says this info is “decidedly evidential” because it is “so highly specific and precisely organized” (344). Schwartz and Russek write: “Details regarding names and relationships are discrete and precise, and can be independently verified by living family and friends. The fact that GD has conducted independent research attempting to discover if his friend’s consciousness continues [reported in Dalzell's, Messages: Evidence for Life after Death], and that GD’s family and friends provide independent confirmation of the facts reported by LC, serves as essential cross-validation of the information received by LC, and appears to preclude telepathy and super-psi in some cases” (346). But this ignores subjective validation as a possible explanation. Schwartz is impressed with the fact that neither he nor Linda Russek could relate to the list of names put forth by LC. He calculates the conditional probabilities of this data at something like 1 in 2.6 trillion that the specifics put forth by LC would come up by chance alone. But there is hardly anything Schwartz won’t count as a specific hit. For example, after the evaluations were over GD told him that he’d also invited some unnamed “spirit scientists” to join in. Schwartz connects this to LC’s claim that she invited Einstein, Carl Jung, and David Bohn to participate. They may have done well in eliminating fraud as an explanation (though the possibility of fraud can’t be ruled out) and “selective memory on the part of the sitter” is ruled out, though he may be confusing selective memory with subjective validation. They’re not the same. And though he thinks rater bias has been eliminated, given the fact that they had to rely on GD’s appraisals and his identification after the fact of whom he invited, subjective validation shouldn’t be eliminated just yet. 2. super-psi: “Extended unconscious telepathy/systemic resonance mechanism with everyone presently living” (348); ruled out because of the language used by LC, which Schwartz thinks indicates she is not simply reporting memories and images, but intentions and interpretations reflecting the information processing of “entities” or “dynamically changing info-energy systems”). The example he gives is of GD reporting that LC’s report reflects Michael’s mind and personality. They don’t think LC is role-playing and impersonating discarnate entities. 3. the organizing consciousness (or soul) hypothesis: The evidence supports the continued existence of “an intentional, living consciousness (soul)” (348). Moreover, telepathy and super-psi are not only compatible with the living-soul hypothesis, they may be necessary conditions for documenting the survival of the soul, i.e., mediums having telepathy with the dead. They note that they plan future research with only the Campbell and Russek Protocols and no sitter/medium dialogue. The sitters will be asked to blindly rate two transcripts. They also plan to do experiments to determine whether the “characteristics of the sitter matter.” I’d say we already know the answer to that question. 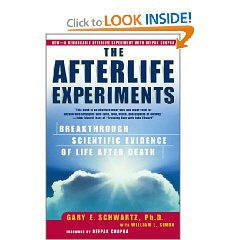 So, does Schwartz have “breakthrough scientific evidence of life after death”? He provides several empirical tests of the afterlife hypothesis, but one wonders if there is anything that he would count as “convincing data to the contrary” of the living soul hypothesis. The only evidence that would be convincing data that the living soul hypothesis is false would be if there were nobody who could speak lists of initials, names, things, and the like and there were nobody who could hear or see any such list and be able to make any sense out of the items or find any connection between them or any significance to them. In short, only if there were no such thing as subjective validation could Schwartz be convinced that the living soul hypothesis might be false. Schwartz is aware that sitters might be biased in their ratings and might give higher ratings of accuracy to items than they deserve, so he asked the sitters to rate down rather than up. Schwartz also has a procedure in some of his experiments and presents a challenge several times to the reader (or any skeptic) to see if they can connect the dots for a given reading. If he or the other experimenters can’t, or if subjects he calls “controls” in one experiment can’t, he takes that as strong evidence that the data is sitter-specific. He often works up the conditional probability calculations, where he shows that the odds of several contingent conditions being related are millions or billions or trillions to one and he takes this as strong evidence that the data is sitter-specific. The problem with this method is that the rest of us don’t have the interest in contacting the dead that the sitter does, but if we do, we don’t have any reason to believe that the items for one sitter would apply to us. I think Schwartz should also consider that some sitters not only have a stronger will to succeed with the reading, but they are better suited for readings because of factors such as how many dead friends and relatives they have, which would be related to such things as age and size of extended family, whether one is a sociable type or not, and so on. History reminds us that sometimes a single experiment, appropriately replicated, can change our vision of the world. Columbus’s voyage, sailing into the beyond, was just such an experiment. What kind of experiment in consciousness research is like sailing into the beyond? Schwartz thinks he’s sailing on the Santa Maria, but it seems obvious to me that he's on the Titanic. 1 What she should have in the envelope was a description of each picture and an identification mark that indicated which spirit allegedly channeled it. The pictures should have been presented to Laurie outside of the presence of the others by an independent experimenter who would record Laurie’s matching of spirits to pictures based on her reveries. The others, who had heard her reveries, might have been shown the pictures and asked to match spirits based on what Laurie had said. Again, these folks—Schwarz, Russek, and Watson—should have been isolated when they did this. 2 This evaluation has to be done after they know what the pictures are and who “did” them. He explains that on the first evaluation they scored at chance level overall, but he doesn’t specify how they know this or when they found this out. It seems that Susy could have told them how well they did before they did the second evaluation. Schwartz’s documentation isn’t very good on this point. 3 This is misleading. This is a subjective assessment of accuracy, but Schwartz makes it sound like an objective test of accurate identification. Afterlife study #2. Accuracy and Replicability of Anomalous After-Death Communication Across Highly Skilled Mediums Gary E. R. Schwartz, Ph.D., Linda G. S. Russek, Ph.D., Lonnie A. Nelson, B.A. and Christopher Barentsen, B.A., (HBO experiment) Journal of the Society for Psychical Research, 2001, Vol. 65.1, Num. 862, pages 1-25. Afterlife study #4. Evidence of Information Retrieval Between Two Mediums (Campbell "White Crow" Readings) by Gary E. R. Schwartz and Linda G. S. Russek, Journal of the Society for Psychical Research, 2001. Anomalous Information Reception by Research Mediums Demonstrated Using a Novel Triple-Blind Protocol. (2007). Julie Beischel, PhD and Gary E. Schwartz. Explore: the Journal of Science and Healing. "Survival or Super-psi?" by Stephen Braude. "Testing Alleged Mediumship: Methods and Results," by Richard Wiseman & Ciarán O’Keeffe (paper presented to the Parapsychological Convention 2004).